When the weekend hit us we prefer to enjoy our great interest in life – bridge. Since I have kids it can be complicated to go away for the weekends, luckily for me the BBO vugraph show most of the great tournaments live so I can kibitz them directly from my favorite chair in my living room and still be able to answer my wife and kinds when they ask all kind of silly questions. A Friday in March I aimed for the favorite chair and plugged in the computer, sadly there was no vugraph to enjoy. 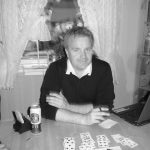 So I headed for a BBO tournament instead – the regular Norwegian tournament “Norsk paa Norsk”. A lot of my friends play, and the Friday issue is of course popular starting at 8 PM. I spotted the Norwegian international Lars Arthur Johansen at one of the top tables. He was playing with his father, Arnfinn, facing another strong Norwegian pair. This gift came up right away, signed Lars Arthur. Most of us would go down in this contract as the cards lie. I guess my preferred line would be to play a club from hand hoping the 50 % chance of finding the ace at west would work. This time EW can turn diamonds and leave me helpless loosing a trump, a diamond and two clubs. Lars Arthur found a more interesting line, maybe it was a better fit for a Friday night tournament than the boring 50 % fellows like me would try? Jack of spades was led to the ace next came a diamond taken by the eight. West turned a trump to the king and ace. Lars Arthur continued with a diamond to the ace then ruffed a diamond. He now cashed the queen of trump followed by a spade ruffed in dummy. Lars Arthur read the hand perfectly when he next ruffed a diamond and cashed the king and queen of spades. Lars Arthur had not planned to misguess this position, he just continued with a heart taken by west with the jack. West found himself endplayed, he continued with the five of clubs. Lars Arthur had made his mind about playing east to hold the ace of clubs so he asked for a small club from dummy. East grabbed his ace but had to give Lars Arthur the contract winning the last trick with the king of clubs. It was a shame this hand came during a BBO event, but it was truly a wonderful played hand making a bridge-lovers heart smile. I enjoyed every second, I hope you did too.